Thanks for your replies.I'll think of another project, maybe a sub. They are rated by music studio's for their clear and defined midrange, but are mostly used with a sub for mixing in studio's. They are in no way hifi speakers, they are popular because if it sounds good on those, it sounds good on every speaker. Mostly they are used in combo with other more precise studio monitors, who have a broader and more neutral frequency response. I don't know about modifing them. The others on this tread know more, but it seems useless to try. If you change te crossover, the advantage of those dissappears and they are just average 2 way speakers. Their shallow mid bass alignment allows for boundary reinforcement too because they were usually located on the meter bridge of a huge analog mixer back in the day. Are you saying you can improve a speakers sound by modifying the crossover? filter. Manufacturers do that all the time when they engineer loudspeaker series. I'll reiterate there is absolutely no point in messing with NS10's. Original examples go for far more than they are worth IMHO. Sell them and buy some better used hifi loudspeakers. properly which may end up being too long. Along the lines of what one can do to learn more about making and modifying crossovers - you can take the existing xo and draw a schematic of it with part component values. Run the drivers without a crossover and use a calibrated mic to measure the minimum phase FRD files for each and both in parallel (sans XO) and the import those FRD files into a simulator like PCD or Xsim. Enter the as drawn XO schematic into the simulation program. Then purely on a computer, you can play around with changing component values or even making a new XO altogether without messing up the actual speaker parts. It will be a very accurate way of predicting the final Xo performance. If you end up with a response you like in the sim, maybe try making the xo and listening to it. It's a great learning process. 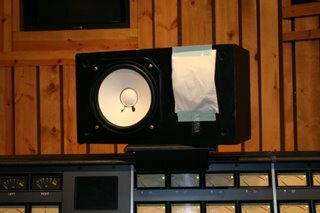 It probably won't yield a better sounding speaker - although flattening the response may help reduce harshness which was sometime accomplished by hanging 2 sheets of Kleenex tissue in front of the tweeter to take the bite off the sound. Last edited by xrk971; 10th May 2016 at 09:37 PM. A little 6 or 7" bass in 18L is never going to be a huge performer at the bottom end, but you can do a bit by lowering the midrange and top subjectively. I ran XRK971 crossover up the flagpole based on what people say about this closed box speaker. Not bassy, and bright. A few 10W wirewound resistors make things look better. 2kHz crossover looks right. Must push the tweeter quite hard. Thanks for doing that System7. How do you happen to have the FRD files for these drivers already? Looks like all it needed was some padding for level balance between bass and tweet. Now we can get rid of the Kleenex.